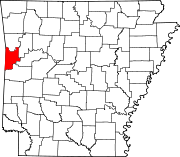 Mansfield is a city in the US state of Arkansas. It is in Scott and Sebastian counties. This page was last changed on 7 November 2018, at 07:48.